Folder Lock lets you password-protect files, folders and drives; encrypt your important files on-the-fly; backup them in real-time; protect portable drives; shred files & drives and clean history. Folder Lock is the most downloaded file-security application with more than 45 million users. It works on 32-bit and 64-bit Windows 10, 8, 7, Vista, XP. 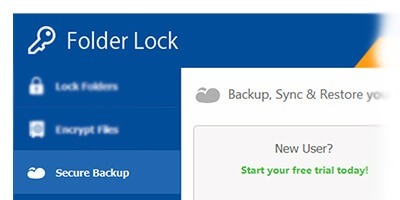 Folder Lock is a revolutionary concept in data security that allows you to not only lock and/or encrypt your files and folders but also optionally backup your encrypted data to an online account, keeping your data synced at all times so that you won’t have to worry about the confidentiality of your data as well as data loss. Besides encryption and secure backup of your files, Folder Lock provides additional award-winning data protection features like Lock Files, Protect USB / CD, Make Wallets, Shred Files, and Clean History. Folder Lock is the ONLY data protection with an online backup solution providing true end-to-end encryption and password protection of all your personal and confidential files at all times. With advanced government-level 256-bit AES encryption on your desktop and 128-bit encryption for all online communications, Folder Lock gives you End-to-End data security to protect all your data, thus, maintaining data confidentiality and integrity at all times. Protecting your data and information from certain unwanted and prying eyes may become a dilemma if you end up with enough personal and private data on your computer or on your external storage devices. Folder Lock uses government-level 256-bit AES encryption for protecting your files. Unlike slow encryption programs, the program uses on-the-fly encryption, a technology that takes seconds to encrypt – even GBs of data. Using this technology, when Folder Lock opens the data contained in a Locker, it does not decrypt each and every file. Rather, only those files and folders are decrypted; that need access. And since files are decrypted into RAM instead of the Hard Disk, this gives you an added security benefit because – 1) Recovery of files is not possible from the Hard Disk, as there was nothing there in the first place; and 2) Data decrypted in RAM is cleared automatically after a system shutdown or restart. Folder Lock is the most comprehensive data protection suite with seven (7) tools; Lock Files, Encrypt Files, Secure Backup, Protect USB/CD, Make Wallets, Shred Files and Clean History. Easily Lock and hide files, folders and drives in one fell swoop. 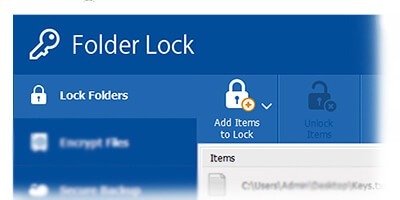 Simply drag and drop items in ‘Lock Files’ and double click to run them. No need to unlock them to be able to run them. Protection works in Safe Mode also. Fastest Encryption on Earth! Folder Lock’s ‘Encrypt Files’ offers the fastest 256-bit AES Encryption everachieved. It uses a patent pending technology that allows the virtual drive to expand automatically depending on how much new data in dumped in, while leaving very small initial footprint when created. Option to either Encrypt or Lock, choices useful for both power users and casual users. Those who want ultimate security can choose encryption. Those who want ultimate speed can choose locking. Unmatched online backup of your encrypted files. End-to-End data protection at all times for secure data protection from start to finish. All end points are covered with industry-standard encryption protocols at all data touch points to render any interception efforts useless. Secure online backup of all your Lockers using industry-standard 128-bit SSL encryption for communication with our online storage servers. Government level encrypted communication during ALL online backup sessions. Unlike other data protection products in the market, Folder Lock saves you enormous time and resources by putting all your files and folders in one location – Locker! Convenient on-the-fly encryption and decryption for ALL your online backups. All data is encryptedinstantaneously when copied to the Locker. No next steps to encrypt. Furthermore, the decryption is automatic and takes place in the memory, leaving no decrypted file on the hard drive ever. A strong industry standard 256-bit AES Encryption is used to encrypt your files for maximum protection. It is one of the most trusted encryption algorithms used in United States Government, including the U.S Military. 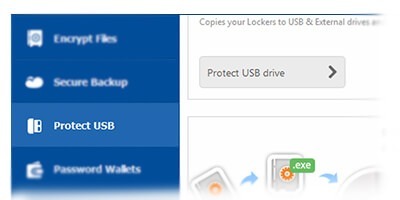 Lockers CANNOT be deleted on the computer where Folder Lock is installed (based on user settings) and Folder Lock CANNOT be uninstalled without the correct password (based on user settings). 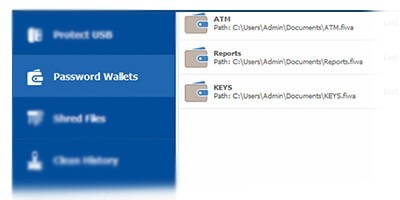 Create and store Wallets to store ALL your confidential information in a secure way. All information is encrypted and safe. 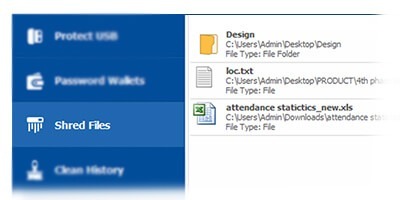 Wallets can be emailed or copied to your USB Drive for viewing on another computer. Folder Lock offers full portability. Apart from USB Flash Drives, Folder Lock can even protect CD/DVD-RW, Memory Sticks, and floppy disks. Simply use Protect USB/CD feature to convert and copy or burn your Locker(s) to your chosen external storage devices. Portable Lockers with self-executable applications run without the need to install Folder Lock on other machines.Take data anywhere without the hassle, worry and fear. Permanently Remove ALL data beyond the point of recoverability. Using a mix of Shred Files and Clean History, you can get rid of any recoverable information on your computer if your spouse or boss is spying on you. Transfer your Locker(s) through emails. Simply share the Locker password with the person you wish to allow access to the protected data in that Locker. Your encrypted data CANNOT be viewed by anyone else, even if they break through your email attachments in between. Folder Lock works flawlessly on all Next Technology Windows, i.e. Windows 7.0/ Vista / XP/Windows 2003 & 2008 Server and their 32 and 64 bit variants. It is also fully compatible on all disk drives types including FAT16, FAT32 and NTFS. Use Hack Attempt Monitoring feature to maximize protection against incorrect password attempts. Trigger Folder Lock to Exit Application, Log-Off Windows, and System Shutdown upon multiple incorrect password attempts. Check Password Strength meter shows you the strength of the password as you type. Basic rule-of-thumb is to use a password that is easy enough to remember but hard enough to easily guess. Folder Lock does NOT save passwords on disk or in the Windows registry, preventing hackers and crackers. Folder Lock is clean, clear and extremely powerful in what it does. Additionally, using the ‘Lock Files’ feature you can quickly lock and/or hide each file, folder, or drive you specify without requiring you to move or copy your data to a Locker. All locked items are listed in ‘Lock Files’. This list not only helps to organize viewing of your Locked files, but also allows you to quickly edit files, with options to enable/disable the protection per item according to requirements. This removes the hassle of having to unlock and unhide each file and folder separately. Even though locking is fast, it is strongly advised to consider encryption for your most important data. Folder Lock is also one of the best data protection tools for protecting all your portable devices. USB Flash Drives, external hard drives, pen drives, Zip drives, floppy disks, even CDs/DVDs-RWs. You have the option to either create a new Locker on, or move/copy an existing Locker to, your selected external drive. Protecting your data on external drives is fast and extremely easy to implement. 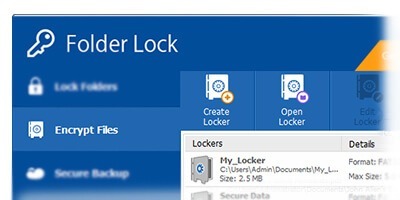 To secure your files directly onto your external drive, simply select the ‘Create Locker’ option in the application and select your chosen external drive as the destination for your new Locker. Additionally, select ‘Move/Copy Locker’ to move/copy an existing Locker to your external drive. Please note that, by default, Lockers are created in your computer’s ‘My Documents’ folder. Portability of your protected files enables you to take your password-protected files anywhere you want without the fear of data-loss or -theft. Folder Lock has been a cutting edge program in data protection and security applications with a robust and comprehensive suite of data security functions and provides advanced data security features for users with government-level data protection needs. Over 25+ Million downloads. Read more about it in the Features section! We are sure you will purchase it today! Reactivation on same computer Yes, product can be activated again using the same registration key when the operating system is formatted or re-installed. Reactivation on different computer Yes, occasionally, only when the first computer where the product is activated is no longer working. Note that misuse of this option will result in permanent blocking of your registration key. Folder Lock’s easy to use and understand user-interface allows single click data protection straight from the Context Menu. Upload all your private data you keep in your Lockers onto a cloud server without manually managing your backups. Secure backup process is automatic and real-time, all changes or modification to your files in your ‘Lockers’ are synched. Folder Lock is the only solution that offers this patent pending technology providing end-to-end data encryption and backup simultaneously. You can copy encrypted lockers to a USB & other external data storage devices using the Protect USB Drive feature. With protect CD/DVD option; you can convert existing lockers to become portable and executable, enabling you to burn lockers onto a CD/DVD. Send private and confidential email securely with encrypt email attachment feature, it allows users to send sensitive data over the internet securely. Save your credit card and debit card related information utilizing 256-bit AES encryption with make Wallets feature. Personalize your digital Wallets with custom icons, card backgrounds, and card templates which enable you to organize your banking information. Keeps your identity safe from identity thieves and e-criminals by securely saving your credit card and banking credentials. 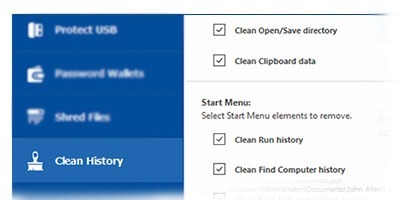 Clean History feature on Folder Lock enables you to delete your online digital footprint, removing all traces of online browsing activities. You have the option to clean windows temp files, open/save directory and clipboard data from any windows computer. Clean Media Player history, MS paint history and word pad history with the option of windows program history cleaning. Folder Lock’s shred file feature enables you to securely delete personal data, removing all traces leading to your personal identity. You can shred entire hard-drives to ensure that all data contained within that drive is securely deleted and cannot be recovered. With Folder Lock’s shred file feature, there’s no limit to how many or what type of files you can delete. Encrypting files requires you to create a locker. To create a locker, click on ‘Encrypt files’ button located on the top left corner, then press ‘Create Locker’ button, assign a label for the locker, setup a password for your locker and finally customize your locker by choosing the type and size. From here all you have to do is drag and drop your files to encrypt them. This option will allow you to lock and encrypt images, encrypt videos, encrypt documents, encrypt folders, encrypt spreadsheets, encrypt excel files, encrypt word files and any other file format you want to encrypt. Encryption will provide you with unbreakable security which uses AES-256-bit encryption to keep your files safe. On the other hand, locking your files provides quick and effective locking and hiding, allowing you to secure your most frequently accessed files which you consider sensitive. Nonetheless, whatever option you choose for files, both options allow you to password protect files, password protect folders, password protect images, password protect videos, password protect documents, password protect word files, password protect excel files and virtually any file type you may want to password protect.